Camping etiquette - it's all about manners and common sense (which seems to be in short supply these days). If you want to see 10 tips on making sure you are not the campground pest, then read on, and find out. 1. Don’t camp close to other campers. If it can be possibly avoided, choose your campsite away from others. Don’t park your van/trailer/tent on top of another established campsite. They were there first, and probably chose that particular spot for a reason. Leave as much space between your camp and another as the situation allows. There are rules on where and when you can use them. Obey them. Running them all hours of the night is unacceptable and very rude. We have seen people go out during the day, and leave them running unattended – leaving the campers who remain behind, to suffer the noise. They are not allowed in most National Parks, so please don’t try to be sneaky and use them. 3. Do not walk through other people’s campsites. Teach your children to do the same. Why people cannot just take a few extra steps to avoid your clearly set out camp, is beyond my comprehension. It's not polite to stroll through a camp that is already set up - but if you do happen to do so, and the people are there, it's nice to offer a quick apology for doing so. Sometimes it's an accident when you come across a campsite that you didn't know was at the end of a trail; but once you do know, then take an alternate route. 4. Leave no trace of your visit. Take your rubbish with you, and leave the campsite spotless. Putting garbage in the firepit, knowing that the next people might burn it, is not acceptable. Finding used disposable nappies tucked into a bush setting near the campsite is not pleasant for anyone. Bottle caps do not burn, so don’t throw them in the firepit; same goes for glass and tins. More tips on leaving no trace when camping are found in this story. Same goes for children.....teach them manners, respect for other campers, and not to become unwanted guests at fellow campsites. We have had a group of children become a nuisance at our campsite (with our own children present), whilst their parents did nothing, and all our hints to them to go away, fell on deaf ears. Your dog may be YOUR best friend. That doesn’t mean everyone will be as enamored with your furry friend, when it wanders into their campsite. When dogs are allowed into campsites, keep them on a leash. 6. Sound travels at night, so late night gatherings around the campfire need to be toned down. The time when most people think you need to start being very quiet, seems to be around 9-10pm. Many campers have early starts so they retire early. Be respectful of such campers, and ensure your partying does not affect others. Just because you can party all night, doesn't mean you should when others are near by. 7. Be friendly to everyone you come across. A quick hello will suffice, but do not invite yourself to join their campfire, or “pop in” for a visit at meal time. Wait to be invited. If people want to chat with you or share a drink, that is great and take that opportunity if you wish to do so and the feeling is mutual. But don’t become an unwanted guest, who hangs around and doesn’t know when it’s time to return to their own campsite. 8. Respect the rules of the campground. Know National Park rules. If it says drive at 5kmph, do so, because it’s for the safety of others, especially children. One rule you will see a lot of in Australia is not to feed the native animals. Please remember that and teach your younger family members the importance of keeping native animals native. 9. If a campsite has facilities, please leave them clean as you can. Pit toilets – put the lid down to avoid attracting flies. Flush toilets – do the same as for pit toilets with the lid, and they are called FLUSH toilets for a reason – use that button!!!! Toilet paper on the ground – if you drop some, pick it up. Showers should be left with nothing in it eg. No soaps, old shampoo bottles etc. 10. No firewood? Don’t chop down any trees. We have seen many campsites where young saplings have been chopped down for firewood, or careless campers have reversed their trailers/vans into young trees in the camp area. Firewood is frequently sold at nearby shops to campgrounds, or sometimes even within the campgrounds itself. Depending on where you camp, sometimes it is acceptable to collect firewood from around the camp area (helps reduce fuel in bushfire season) – but once again, know the rules of where you are. Want to hear more Camping Etiquette ideas, submitted by you, our readers? 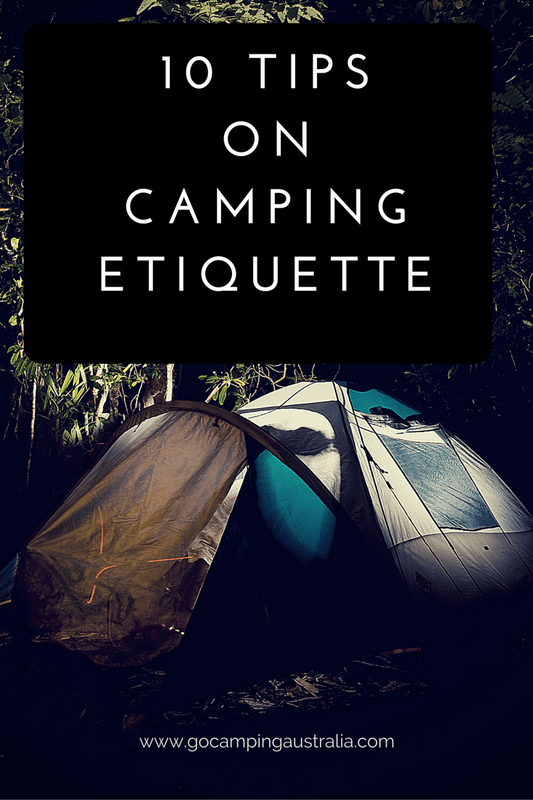 Read Camping Etiquette Part 2. Please supervise children around toilet blocks at all times. Toilet blocks are not play areas and should not be treated as such.